The Wide Field and Planetary Camera 2. Seeing the Hubble's Wide Field and Planetary Camera 2 last week is like visiting an old and venerable explorer just back from a long and exhausting expedition. 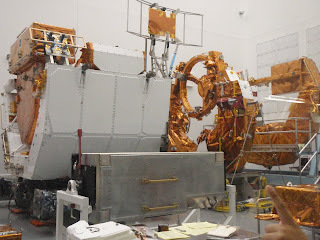 The camera, which flew back from orbit this May in the payload of the Atlantis Shuttle, was sitting in a spacious, stark-white clean room on the campus of NASA Goddard Space Flight Center. Although it weighs 610 pounds—NASA writers often compare it to a baby grand piano—it was dwarfed by giant chunks of the space shuttle's payload, including the circular catching mechanism that grasped the telescope. 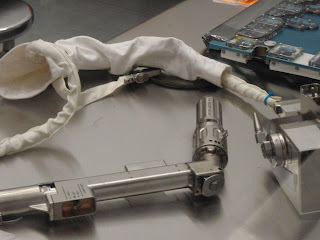 Pieces from Atlantis's payload that cradled new instruments and caught Hubble. If I could look inside the camera—unfortunately, a healthy layer of cleanroom glass separates me from it—I'd see four tiny mirrors, each the size of a nickel. 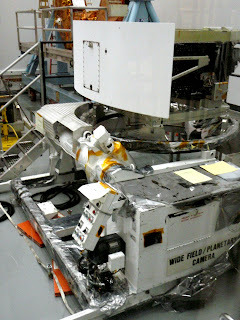 These mirrors were replaced in the WFPC2 ("whiff-pick two," for the cool kids) before it was flown up to Hubble in 1993, taking the place of the first camera. The mirrors offset a spherical aberration in Hubble's main 8-foot mirror, an aberration that cost Hubble's photos their clarity for the first three years of its life. Since then, WFPC2 has snapped over 135,000 close-ups of the universe's beauties, and it doesn't look the worse for wear, except for a few dings in its cover from meteorites. Like most of what's come back from space, the venerable explorer will find its way from its current spot, just around the corner from the cleanroom where it was assembled, to the Smithsonian's collection. 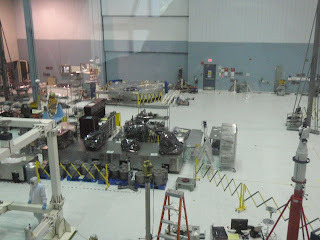 Goddard had an important role in the recent servicing mission. It has replicas of all three pieces of the massive Hubble—the telescope portion alone is bigger than a bus, and the electronics and instruments cabinets are similarly gargantuan. Familiarity with the wildly unfamiliar is key to getting anything done in space, STS-125 astronauts trained extensively on the replicas before the mission. Goddard's engineers designed repair tools that made up for the ungainliness of space suits—you try turning a screwdriver while wearing a stiff inflated glove!—and prevented loose screws from floating into space. 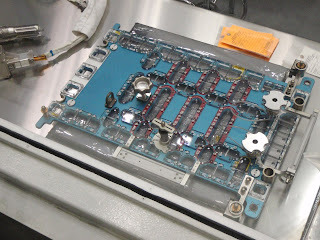 A replica of Hubble's fuse box. 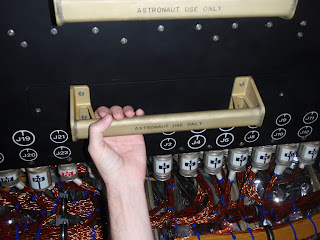 It took astronauts twelve hours to change these fuses. A Hubble tool - I wonder what this does? This face plate fit over an especially intricate panel to catch loosened screws. Newly outfitted with the Wide Field and Planetary Camera 3, Hubble's finishing up calibrations, although scientists paused the tune-up to snap an early photo of a large new crater on Jupiter. But by early fall our eye on the universe should be fully back in action. What ever happened to Hven?